Does your dog have an embarrassing and annoying problem of unexplained frequent urination? Does it happen especially if they are scared or excited? Your pet may be suffering from submissive or excitement urination. This is not a training issue, but an involuntary reflex that will need patience to fix. Urinates when someone (especially strangers) approaches him. Urinates when crouching, rolling over (exposing their stomach) or has their tail between their legs, indicating a submissiveness. Get down on their level, not just bending over, but kneel down. Try approaching from the side vs. the front. 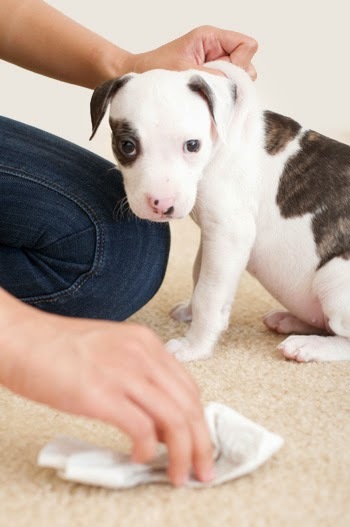 Teach them commands that can be used to distract and encourage confident behaviors and then reward them for performing them. For example have them “sit” or “shake” when being greeted. This will help them feel in control of the situation and lessen the anxiety. We have many patients report that using Psy-Stabil has helped their “nervous” dog feel calmer and re-balance. Keep greetings low-key…do not greet your pet with excited tones or gestures. Ignore him when he is excited, wait until he calms down. If a veterinarian determines that your pet suffers from a Urinary Tract Infection (UTI) having a property diet and the right supplements can help and provide them with relief. The antibiotics used to treat the UTI won’t take care of the inflammation if the diet you are feeding is high in carbohydrates or allergens. A grain-free, low carbohydrate diet and the right supplements provide your pet with the nutrients and immune support needed to fight off UTIs. Some of our featured products include Amazing Omegas, UTI Prevention and Power Probiotic.